Cardoon – khorchouf or kanaria in Arabic – is popular in North Africa and the Mediterranean. Moroccans use it in such tagines as chicken with cardoons and lamb or beef tagine with cardoons. 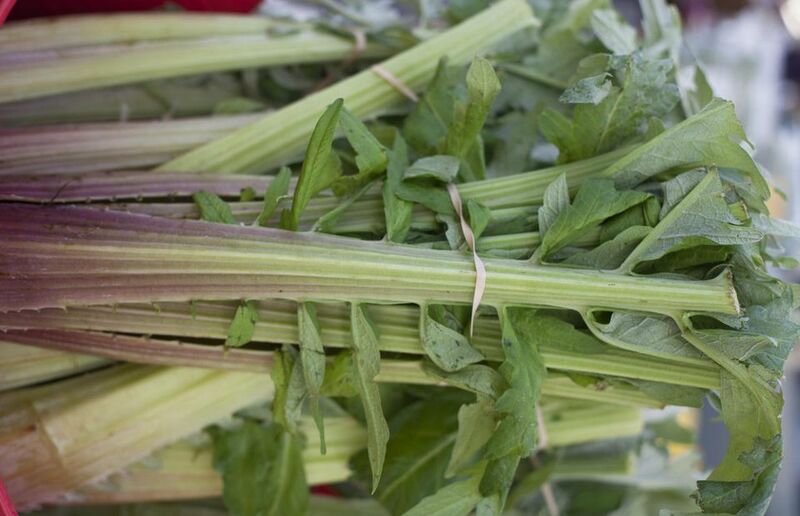 Cardoon is available in some American supermarkets in the winter months, but you may have better luck finding them at farmers markets. The stalks of cardoon look like giant celery, but they need to be pared and cleaned before they're cooked. Be very careful of the prickles that may be on the leaves and edges of the stalks. Wearing gloves will help protect your hands from them, and also will prevent your fingers from staining brown. It's very difficult to pare cardoon if the stalks are not firm and fresh. Try to work with the cardoon the day you buy it, and then refrigerate the cleaned cardoon until you need it. Cut across the top of the bunch of cardoons to remove the large leaves and the very thin tops of the stalks. Watch out for prickles on the leaves and stalks. This bunch of cardoon had already had the leaves removed when we bought it at the souk. Now you'll be working with each stalk one by one. Cut off one of the stalks near the base of the cardoon, just above the point where the stalk widens. Remember to be careful of the tiny prickle-like spines! Use your knife to remove any small leaves at the top of the stalk. You'll notice that they protrude from the two edges which run along the length of the flat or slightly concave side of the stalk. Now pare the entire length of the two edges next to the flat side of the stalk. This will remove any remaining prickles and tiny leaves, leaving the stalk safe to handle. If you find a paring knife difficult to manage, try using a vegetable peeler. The entire stalk of cardoon is covered in silver-hued strings. Start paring at the top of the stalk and peel downwards to remove the strings. Again, you may use a vegetable peeler if you find it easier. Continue paring the entire length of the stalk, removing the strings from all the ribbed sides. Here you can see how long the strings are. It's OK to have some silver color remaining on the stalk but try to remove as many strings as possible so that the stalk takes on a fresh, green appearance. The flat side of the cardoon stalk also has a layer that should be removed. Again, start at the narrow top of the stalk and work downwards to remove the thin skin and strings. If you have trouble paring the part of the stalk where it becomes concave, don't worry. More of that skin will pull off when you cut the stalk into pieces in the next step. Now that the cardoon stalk has been pared cut it into pieces about three or four inches long. As you cut the stalk, more strings and film will peel off. If you had trouble paring the flat or concave section of the stalk before, you'll find it easier to remove that skin if you cut the stalk from the ribbed side toward the flat side as shown. It's also easier to pare the concave side when working with small pieces of stalk. Let the pieces of cardoon fall into a bowl as you cut, and immediately squeeze fresh lemon juice over the pieces. Toss the pieces in the juice to coat them well. Peeled cardoon turns brown very quickly, and a generous amount of lemon juice will counter the oxidation process so that the stalks remain green until cooking time. You can also use vinegar if you don't have lemon juice. Repeat the entire paring process – from removing the leaves and prickles to paring the strings and skin – with the remaining stalks of cardoon. The thin, whitish, young stalks covered with soft leaves are good to use as well. They're also easier to clean – just scrape off the white coating. Be sure you squeeze lemon juice on the cardoon every time you add a cut stalk to the bowl. This cardoon is ready to cook. If needed cover it tightly with plastic wrap and store it in the refrigerator for up to four days before cooking it. It kept perfectly and didn't turn brown at all. The cleaned cardoon will stay this beautiful green color for days on end as long as only lemon juice comes in contact with it. However, submerging cardoon in acidulated water is fine if you plan to cook cardoons shortly after you prep them. Keep the cardoon covered tightly, and wash it only when you're ready to add it to your pot for cooking.